Parkes & Co Accountants provide “hands on” accounting and taxation solutions to a wide range of clients including Sole Traders, Partnerships, Directors and much more. We can run your payroll system, deal with all PAYE and RTI administration and provide timely advice in dealing with Inland Revenue issues. Over a period of many years Parkes & Co has developed strong business relationships with numerous highly qualified specialist business and financial advisers. Parkes & Co Accountants Limited is an independent accountancy and business advisory practice, based in Kingswinford in the West Midlands, originally established in 1982 evolving from Parkes & Co Partnership. Our aim is to provide a highly personalised service with specialist advice that makes a real difference to you and your business. Running any business is a challenge, so it helps to have a great team at your disposal to support you. Our experience, knowledge and smart business thinking, will help you every step of the way. If you need an accountant that provides better answers, we believe that Parkes & Co have the solutions. Our ethos is by working together, we help your organisation prosper in today’s tough economic climate. Your aspirations and financial priorities are unique. Parkes & Co provides expert tax and business advice to help you reach your financial goals, business objectives, and plan for the future of the people who are important to you. We advise small, medium enterprises (SMEs) and high net worth individuals throughout the UK. Whether you are thinking of starting your own business or you are already established, we are here to offer full advice and support to carry you through those important decisions. 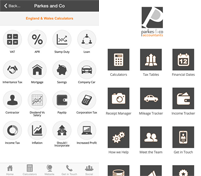 This powerful new free Finance & Tax App has been developed by the team at Parkes and Co Accountants to give you key financial and tax information, tools, features and news at your fingertips, 24/7. The Parkes and Co Accountants App has been designed to be a useful place to get critical information whenever you need it. As always, the team at Parkes and Co Accountants is on hand to provide professional, personal advice and guidance. The Finance &Tax App is packed with tools that you and our future clients will love.